Drink 3-times more water, get healthier, have more energy and avoid headaches with Ulla – your personal hydration coach. Did you know that the average adult only drinks about 2.5 cups of water a day (20oz), falling way short of the recommended 8 eight ounce cups. Water is essential for good health and when you are dehydrated your body responds with headaches, fatigue, lightheadedness, poor concentration, bad breath, digestive issues, sudden food cravings and the list goes on and on. 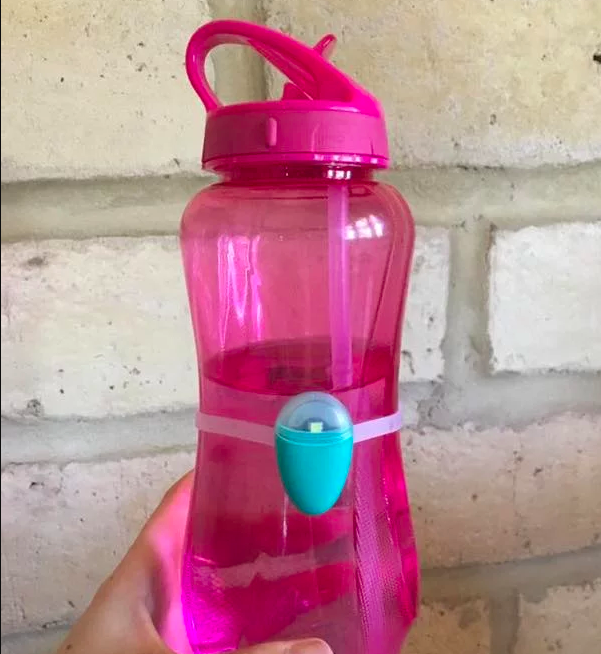 Today I am going to introduce you to Ulla, a little piece of tech that is going to help you remember to drink more water so you can live a healthier life. Seriously, enough of the lectures, back to why you are here. Today, I will be introducing you to Ulla, it’s a smart device (a cute egg-like tech) that reminds you to drink more water. It is really a simple gadget that does not need any charging or even a mobile app – it comes with a battery that lasts for 6 months. I tried this cute hydration reminder to see if it lives up to its description. Here are the features that I love the most about it. Smart alerts. We shouldn’t drink water only when we’re thirsty. This smart hydration reminder has sensors that will alert you to drink even before you get dehydrated. The LED light will flash every 30 – 40 minutes or so depending on how frequently you’re drinking. You don’t have to consume all the water in one go; taking small sips is already enough. Tilt and proximity sensors. The tilt sensors work by tracking your drinking habits and whether you’re drinking frequently. If it senses that you’re not drinking enough, it will automatically remind you and it won’t stop until you actually drink. The proximity sensors also sense whether you’re nearby, so it won’t constantly flash if you’re away. Fits any container. You can actually find a lot of containers with built-in sensors, but its disadvantage is that you can’t use it for your other glasses or mugs. This hydration reminder can fit any water bottle, glass, or cup so you can switch any time and still be reminded to drink. All you have to do is put the band around the container then attach it to the band. Feel healthier. Water solves almost any problem. Have a lot of zits? Drink water. Have dry and scaly skin? Feeling lethargic and having a lot of headaches? Want to lose weight? Feeling constipated. Drinking plenty of water will make it all better. Eco-friendly. Not only is it good for your health, but it’s also good for nature too. This water drinking reminder is best used with a reusable water bottle instead of plastic bottles that you’ll just throw away after a single use. And if you take care of it properly, it will last for a good amount of time. At first glance at this device, you might be skeptical about it, but you will also be curious about it. how does this little egg-like device do the trick? The ingenuity behind this device is commendable. You have six colors to choose from. The device comes in a small box with an instruction booklet that shows you how its used or works. Even though it is splash resistant, it is important to note that the Ulla device is not water resistant, be careful not to drop it into a cup filled with water or when it’s dropped in a dishwasher or your sink. Take advantage of the Warranty and Returns, because they want you to be satisfied with what you are paying for, they’ve added a 30-day return policy, just make sure you have the original pack and your receipt then you can always take it back if you aren’t satisfied with it and get a full refund. It requires no charging – you have one less charging to worry about. It has a light reminder. It doesn’t have an app. Ulla is attached to your water bottle or drinking cup and can detect when you pick your cup or bottle up to have a drink. It’s set to blink a small flashing light if it doesn’t sense that you had a drink every 40 minutes or so. Ulla’s designed to fit easily on any bottle with a special silicone mounting band. Automatic on/off : Ulla wakes up when you enter the room in the morning, and goes quietly to sleep when you turn the lights off for the night. Like with any great product, Ulla does want you to be satisfied with your purchase so they are generous enough to offer a 30 day return policy. You need to keep the original packaging and receipt and if you are unsatisfied within 30 days of your purchase you can return the product for a full refund. So what are people saying about this product? The general public opinion is very positive and the majority of the people who buy Ulla are happy and satisfied with their purchase! Judging by the role it plays in our lives, a water reminder is definitely one of the things that we need. It can be used in the office or at home every day. The Ulla device reminds you to take a sip of water even when you are really busy or distracted. So, I will give it our Spot the trends seal of approval. Ulla Review is a fully-automated water drinking reminder that attaches to any water bottle, mug, glass, and more. It has several sensors to measure how much water you need to drink. Previous articleThePhotoStick Mobile Review 2019: is it Worth the Cost? Next articleClearView: Can You Really Turn Night Into Day?